Today the U.S. Mint began accepting orders for rolls, bags, and boxes of the 2016 Ronald Reagan Presidential $1 Coin. This is the third Presidential dollar released this year and it marks the conclusion of the Mint’s Presidential dollar program, which launched in 2007. 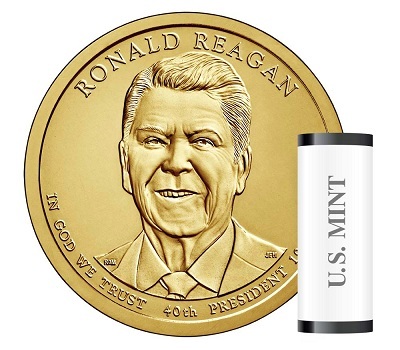 The Reagan dollars are available in six product options that offer varying quantities of the issue struck at the Philadelphia (P) and Denver (D) Mints. Collectors can purchase rolls of 25 Presidential dollars (P or D) for $32.95, 100-coin bags (P or D) for $111.95, and 250-coin boxes (P or D) for $275.95. The obverse of the Reagan dollar was designed by Richard Masters and sculpted by Joseph Menna. It features a forward-facing portrait of Reagan, with the inscriptions RONALD REAGAN, IN GOD WE TRUST, 40th PRESIDENT, and his years in office, 1981-1989. 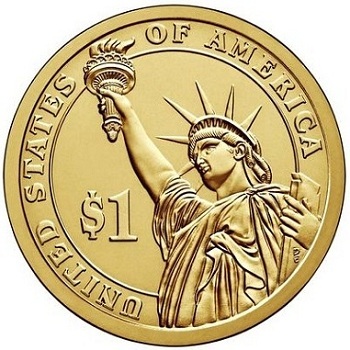 The reverse is common to all Presidential $1 coins and was designed and engraved by Don Everhart. It includes an image of the Statue of Liberty beside the coin’s $1 denomination, with UNITED STATES OF AMERICA curving along the rim. The conclusion of the Presidential dollar coins series coincides with the release of the final First Spouse gold coins, which feature Nancy Reagan. Future products containing the Reagan dollar include the 2016 Ronald Reagan Presidential $1 Coin and First Spouse Medal set, due for release on July 5, and the 2016 Ronald Reagan One Dollar Coin Cover, slated for issue some time in August. For more information on the U.S. Mint’s Presidential dollar series, please visit its Web site.